Apple has been playing it cool on the WiFi side of things lately. It started with the previous Airport Extreme (Gen 4) which quietly introduced three spatial stream support, followed up by the Early 2011 MacBook Pro update which brought a three spatial stream compliant WLAN stack, and now has continued with an even more understated update for the Time Capsule (4th generation) and Airport Extreme (5th generation). Both updates launched just prior to this latest round of Apple launches, which included the Mac Mini, Macbook Air, and Thunderbolt Display, but unlike those three, the Time Capsule and Airport Extreme updates saw almost no mention. 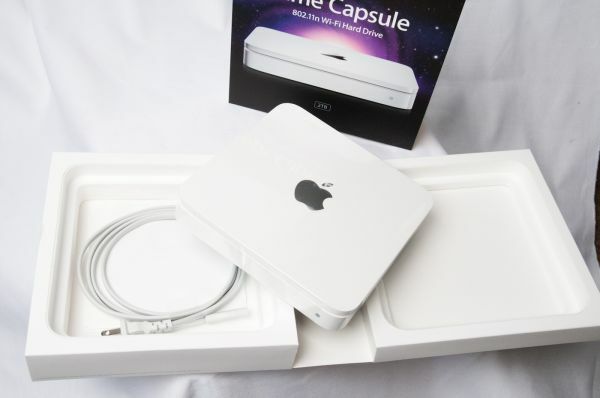 Starting with the exterior packaging, you’d be hard pressed to tell that a particular Time Capsule or Airport Extreme is the newer refresh. I no longer have the old Airport Extreme packaging, but the new device box is virtually indistinguishable. Outside of bumping the supported storage capacity for the Time Capsule up to 3TB, there’s no real obvious giveaway for the Time Capsule either. 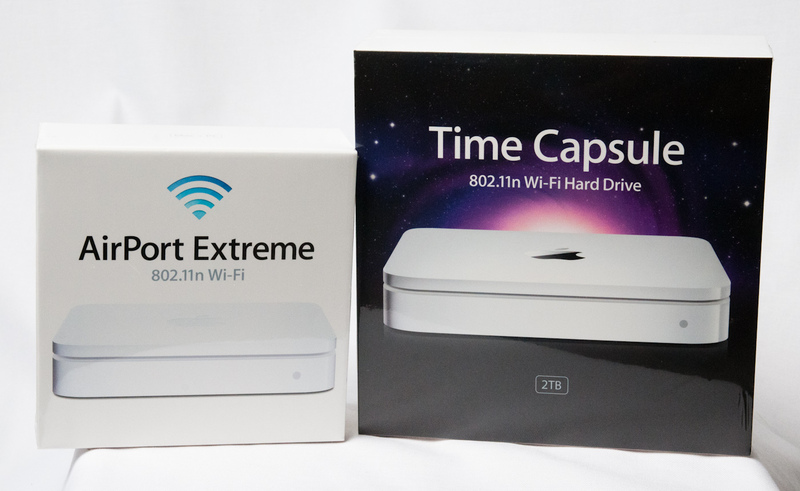 The only way to tell which version is which by looking at the box is by the model numbers—MD031LL/A for the 5th generation Airport Extreme, and MD032LL/A for the 2TB 4th generation Time Capsule. 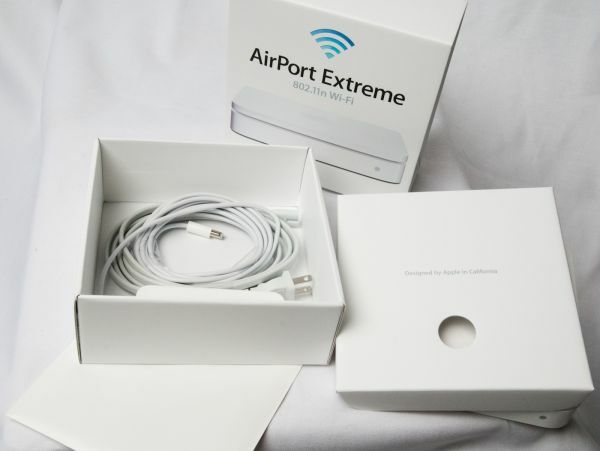 The contents of the Airport Extreme box remain the same as well, starting with the device itself on top, and underneath it, a power cable, 12 volt power supply (model A1202) and some literature about setup in a white plastic bag. The Time Capsule box is much the same affair, with the device inside, a power cable, no power supply (since it’s internal), and some literature. I stacked all three devices up so you can compare physically. Really the only big giveaway between the two Airport Extremes is an extra line of text on the previous generation, and of course the model number or FCC ID. 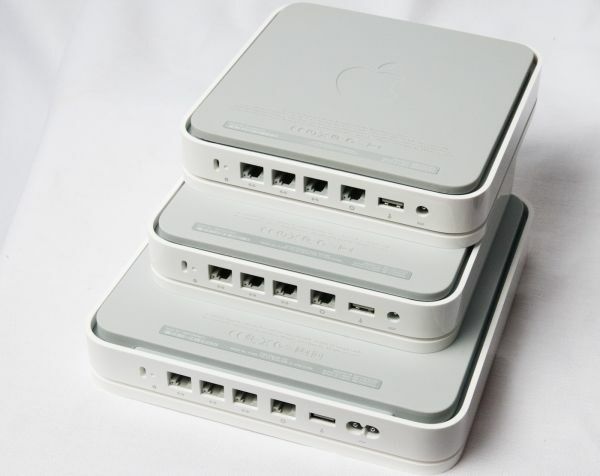 Both the Time Capsule and Airport Extreme still retain the same port configuration—four GigE ports, one USB 2.0 port, power, reset, and a Kensington security slot. Those four gigabit ethernet ports can either be used as a switch, or you can use the device as a router and then the leftmost port becomes WAN and the right three become LAN. At this point it isn’t really looking like there’s much different, but exterior appearances can be deceptive. "Airport Extreme makes a hue difference"
Good catch, thanks, should be fixed! I will never go with TC unless they have a better backup solution of the TC itself. Totally agreed, edited those tables to make it more easy to follow. time capsule wins an award for stealing your money. $300 for a $150 simultaneous dual-band, three-stream router with gigabit switch, on board SATA controller and an $80 HD, all in one compact little unit along with the PSU? Not a bad deal, really.